exPress-o: Cheers to a restful weekend. Darlings, happy Friday! What are you up to this weekend? Balazs and I had a plan to catch a film tonight with friends but since I'm just getting out of a cold and Balazs is in the midst of it, we will probably spend the next two days napping, eating soup and watching Comedians in Cars Getting Coffee. Have you see it? It's awesome! How about you, lovelies? Have a wonderful next two days and as always here are a few nifty and cool links for your weekend blog hopping fun! The No.1 thing you must do on a first date. Would you? Fancy a trick to perfect scrambled eggs? I adore this voice-activated light show in NYC's Park Avenue Tunnel. Have you seen Zara's fall collection? It's swoonworthy. Great boots for under $100! Blogmilk's new theme collection is beautiful! On vacation...Do you feel the same way? Changing lifestyle and finding balance. 20 things to start doing right away. No.9 is my favourite! Have you tried this natural cold remedy bath? I think I need to give it a go. Braid on braid = autumn hairdo perfection. Plus, a reminder about the lovely A Matter Of Choice jewelry shop discount code for all exPress-o readers: EXPRESSO. such wonderful and fun links, thank you! 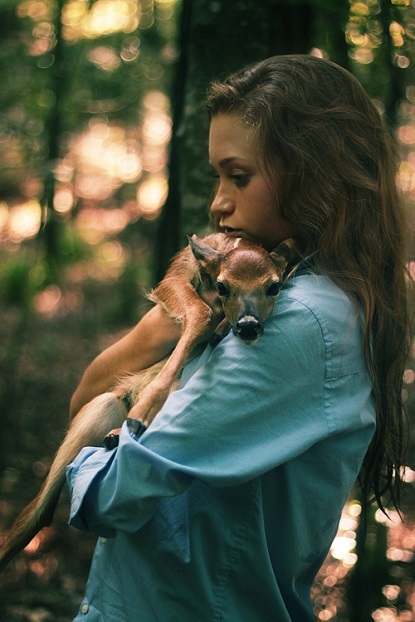 A puppy AND a fawn! Cuteness!! Happy weekend to you! Have a great weekend! Glad you are on the mends, hope your mister is too. Off to practice those 20 things! it's been so long since i've been here. please check out my latest post! That red coat over at Garance Doré looks perfect. But I don't think I would ever buy a colourful coat, I always go for a very dark grey or black, so it goes with everything. Feel better soon to the both of you. Yes, Jerry is just the ticket to laughing and feeling great!! Thanks, Laura:) You are such a sweetheart!